Diseases caused by the bacteria�s Streptococcus bovis, (young bird sickness) and E-coli. This cure is active against both problems in racing pigeons. A magistral prepared water soluble powder with a combination from 5 active antibiotics ad dextrose anhydrite. 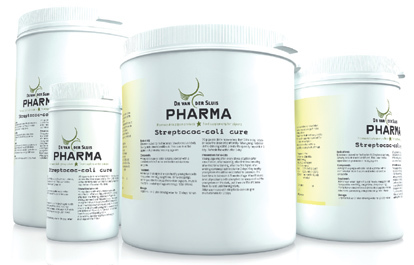 Administer when signs of e-coli (mostly youngsters with no appetite, vomiting, weight lose, slimy droppings, mortality) or streptococcus (more older pigeons, muscle infections, paralysing of legs and wings, total illness). 1 spoonful per 2 litre drinking water for 10 days. When 20 pigeons drink more or less than 1 litre a day, reduce or raise the dose proportionally. When adminster medicines in the drinking water, provide the quantity they drink in 1 day. Refresh the water after 1 day. Young pigeons after every stress-situation (after vaccination, after weaning, after first time basketing, after first time training, after the first flights, after ending darkness) administer for 2 days. Only healthy youngsters should be vaccinated for paramyxo .The best time is between 4-5 weeks of age. When there are a lot of problems with young bird sickness do not put the youngsters on the dark, put them on litter and leave them to rest until training starts.